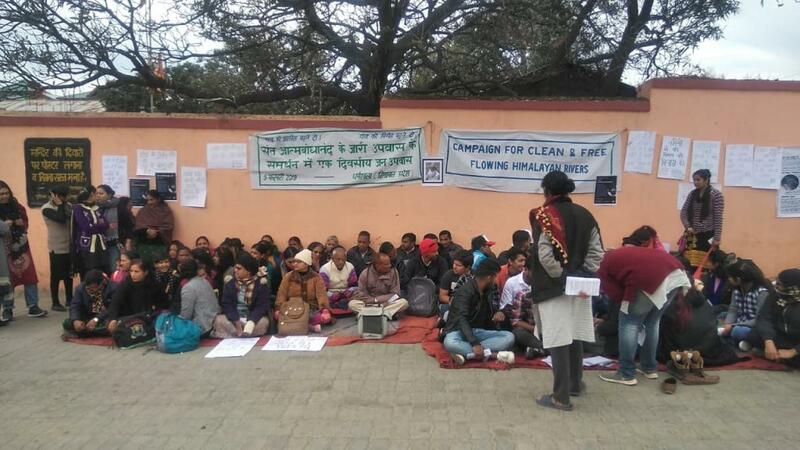 More than 100 activists staged a dharna and observed a token fast in Himachal Pradesh’s Dharamshala on February 5, 2019, demanding clean and free flowing Himalayan rivers. They also sent a memorandum to Chief Minister Jairam Thakur drawing his attention to the crisis the rivers are facing owing to unprecedented development, particularly the numerous hydropower projects, and severe lack of monitoring by the regulatory authorities. “These urgent problems have several ecological, social, cultural and economic impacts and these are becoming irreversible,” read the memorandum. The activists said hydroelectric power projects, dumping of industrial waste, unregulated urbanisation and tourism and illegal sand and stone mining are going on near the rivers without any planning, environment impact assessment and carrying capacity studies. “Climatic changes are leading to extreme weather events and a decline in river discharge. The rate of de-glaciation in ecologically fragile regions shows that we need to act fast to protect our water sources, which are our life lines. We believe that until and unless a larger policy change occurs there is little or no hope to save the Himalayan rivers,” the activists mention in the memorandum. The memorandum contains a 10-point wish list which the activists want the government to act upon. One of them is that small streams and tributaries need to be marked for their fragility to ensure their sustained flow because they support ecological diversity and livelihoods. “Thriving fish farms on the river, small home-based eco-tourism initiatives and cultural preservation, all become possible in such an environment. These need to be declared as a ‘no-go zone’ not just for hydro projects but also for large scale sand mining, polluting industries and unplanned construction of both roads and buildings and rising burden of tourism,” the memorandum says. Another demand is that rivers like Chenab and Satluj in upper Kinnaur and Spiti, which are still free flowing and are in ecologically fragile regions, should also be declared as eco-sensitive zones and no-go for major construction activities. The activists also want public consultation in the state and conduction of cumulative environment impact assessment studies (CEIA) for all river basins in an independent, thorough and multi-disciplinary fashion before building any dams and hydropower projects. The memorandum points out that while the draft report for Satluj, Chenab and Beas are already complete, locals were hardly consulted for Satluj and not at all for the other two. “These studies have become mere formalities as the process of giving environment and forest clearances for hydropower projects have been de-linked from the CEIA process. The government can also consider carrying out a citizen’s referendum,” the memorandum reads. They also urge that the orders of the National Green Tribunal (NGT) and the high court be strictly followed when it comes to sand and stone mining. The lack of controlled and regulated construction and tourism is degrading the state’s rivers, say the protesting activists. “Four-lane road projects and blindly widening roads are not only damaging forests, but also increasing erosion and the siltation on rivers. Since the sewerage system in the state’s urban areas is highly inadequate, rivers become the dumping ground for untreated sewage,” the document points out. They have also called for stringent action against those dumping industrial effluents in rivers particularly in industrial pockets of Baddi Barotiwala Nalagarh and Paonta Sahib and that pollution be treated at source. The activists blame Himachal Pradesh Pollution Control Board (HPPCB) and Irrigation and Public Health (IPH) departments for working to make the developers’ lives easy. “The amendments in the Hydropower Policy of 2006 made in 2014 and 2016 need to be withdrawn as they dilute the process of No Objection Certificates (NOCs) from these departments prior to approval of hydro projects,” the memorandum states. Also, river flow should be monitored to ensure they are not plugged with projects and there’s a need for combined protection of rivers and forests. “The Forest Rights Act (FRA) 2006, if implemented in full spirit, will strengthen community control and ownership over forests around river basins (which mostly fall under the category of ‘Forest lands’). This would also mean having the responsibility of conserving and protecting these resources. Unfortunately, the Himachal government has the poorest track record in FRA implementation with the state and forest bureaucracy impeding rather than facilitating the filing of claims process,” the activists say. They also demand action plans for each of the river basins with the involvement of local community, women representatives, citizens groups, environmentalists and experts, along with chosen government departments. “It is only through a political commitment towards a policy shift as well as a new initiative in environment governance, that we can protect the natural heritage and the lifelines of the state,” reads the memorandum.